There are two methods available to download adhaar card online. One way is providing aadhar Number and the 2nd way is downloading with enrollment number. Why we have to download online? earlier uidai India sent residents by post but now the only option is available by downloading adhaar portal. this reduced lot headache. In Rural areas, People are paying 50-Rupees for eseva or internet centers to provide color xerox of adhaar card later lamination cost includes 25-100 Rupees. Enter Full Name as same as On the Enrollment Slip. Your Area Pincode available on the Enrollment Slip. Provide captcha verification code as same on the Box. Enter OTP to validate & download the Adhaar card. Enter Pincode to open the e aadhaar card. Later validate it by adding security certificates to the system the Then Proceed to Print. 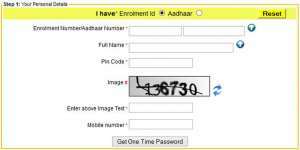 How to Know Adhaar Number with Enrollment Id? In this method, uid number will be sent to your registered Mobile Number. visit https://uidai.gov.in/ Enrollment services>> get UID Number on mobile. Enter Mobile Number and click verify authorize with OTP. Then Get on Mobile. 3 How to Know Adhaar Number with Enrollment Id?